These Blades Could Save Your Life! The age-old saying is that you should not bring a knife to a gun fight… but if I found myself in a gun fight and my life depended on it—I would feel more than comfortable with these knives as a backup. Oh, in case you were wondering, (SHTF) means when Sh#@ Hits The Fan. I think a gun fight would qualify as a SHTF event. As you can see, if I asked 10 different talking heads, I could easily have 10 different list with either a lot of overlap, or hardly any. So, without further ado, I would like to share my list, I think it validates the comments about preferences, but I would suggest you physically go and touch and feel the knife, like how you would if you were buying a gun. 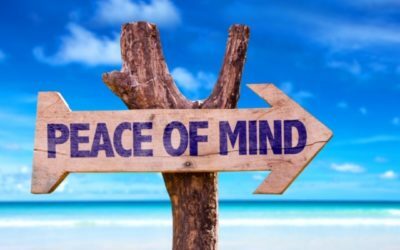 My article, Why is it so intimidating to go into gun shops? walks you through the steps you should take when buying a gun, and they are not so dissimilar to buying a knife. You should know if it’s a foldable you want to choose. Open it, see how the action is on it. See if it fits where you intend to carry it, i.e., purse, console, jacket, pants pocket, sheath, etc. Also make sure it serves your needs, is it a foldable, straight edge, full-tang, half-tang, comes with a sheath, no sheath, boot carry, belt carry, etc. Note: This post contains affiliate links, which means if you buy the product, I may receive some monetary compensation. I only recommend products I use and love! CRKT Shrill Fixed Blade Knife with Sheath is a Light Weight, Double Edged Ti Nitride Finish, with a resin infused fiber handle, It comes with a leather sheath with a boot clip model #2075. Made by Columbia River Knife and Tool Co. 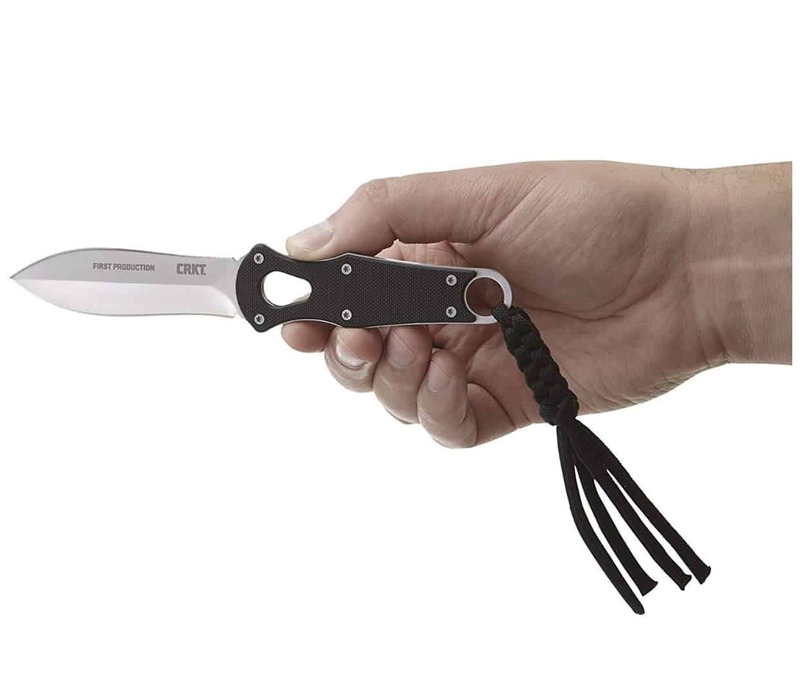 The CRKT is a 4.8” long dual-edged design. Matthew Lerch of Sussex, Wisconsin, designed this beauty. He has been balancing art with mechanics for over 31 years and he’s raising the bar once again with the Shrill. 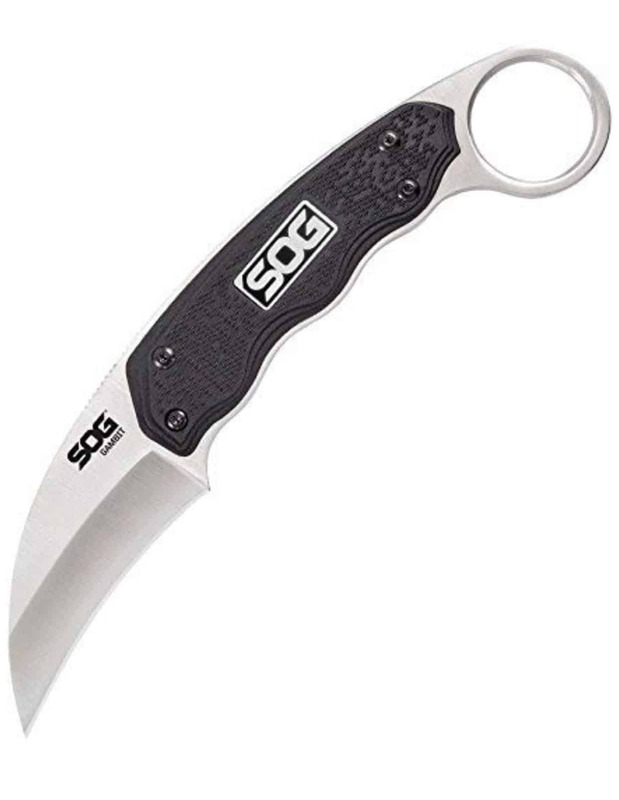 SOG Specialty Knives & Tools GB1001-CP Gambit Fixed-Blade Knife with Sheath The GB1001-CP was designed to handle multiple uses, the SOG Gambit is built to perform at all times. Comfortable in both forward and reverse grip, the unique, ergonomic handle is held up by the knife’s full tang design for added strength. The curved 2.6-inch blade offers added functionality for various tasks and comes with a hard nylon sheath with adjustable clip for easy carry. Smith & Wesson SWF606 Full Tang Boot Knife is a fixed blade knife, made of stone washed 8Cr13MoV high carbon stainless steel with a dual edged spear point blade and a dual finger choice. It has black TPE handle slabs, a lanyard hole, and pommel jumping. It comes with a premium black leather boot/belt sheath with security snap. Overall length: 8.64-inch (21.95 cm) weight: 0.37 lbs. 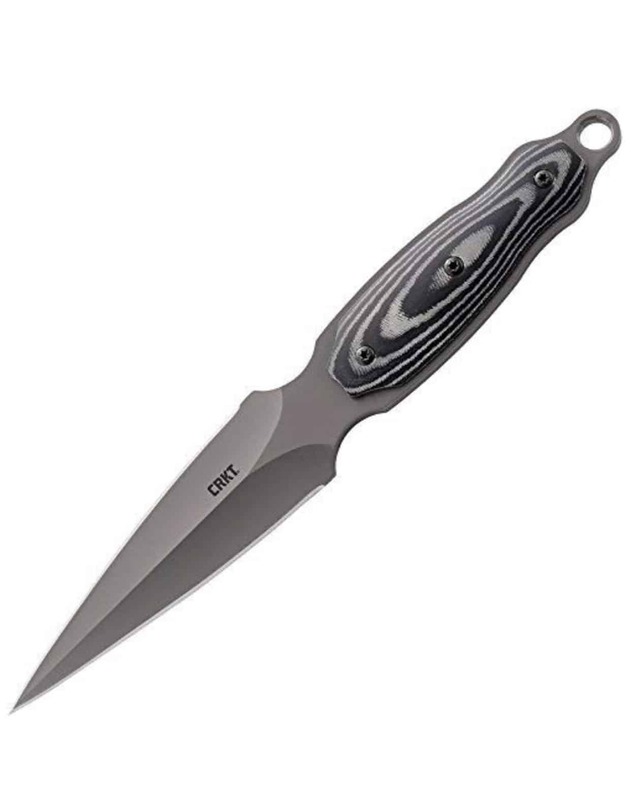 CRKT Sting 3B Fixed Blade Knife with Sheath The CRKT Sting is compact light weight, double edged blade made of stainless steel. The Sting has a skeletonized handle, G10, comes with a boot clip nylon sheath model # 2025. The Sting is billed as the lightest, slimmest, most compact Sting fixed blade knife ever created. A.G. Russell introduced the original Sting in the 1970s and the latest iteration, the Sting 3B, hails from a pedigree that is both proven and prodigious. The Sting 3B is a boot knife that is ultra-lightweight, yet large enough for self-defense in any close quarter’s situation. 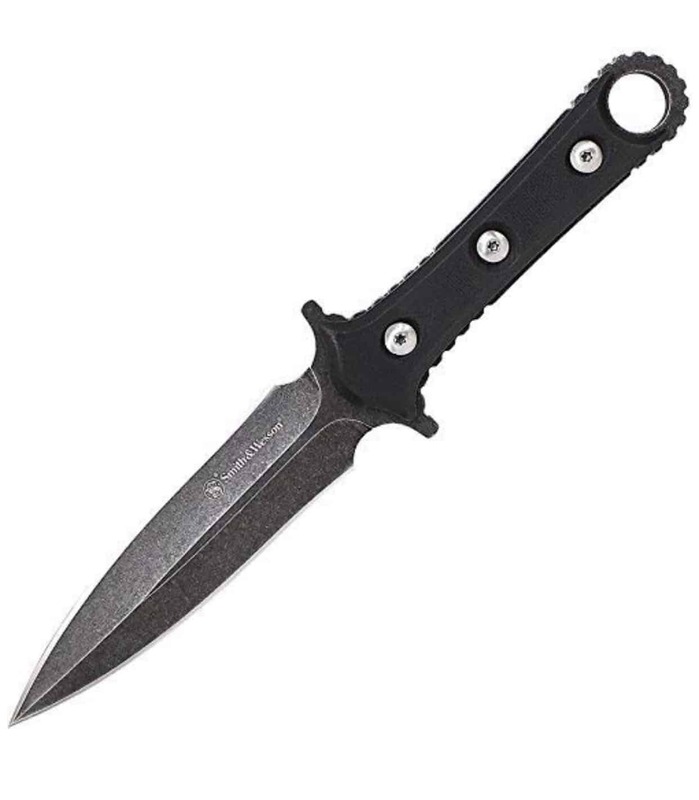 The satin dagger blade is sharpened on both edges and is ideal for self-defense. The G10 handle scales add texture to the skeletonized full tang knife. 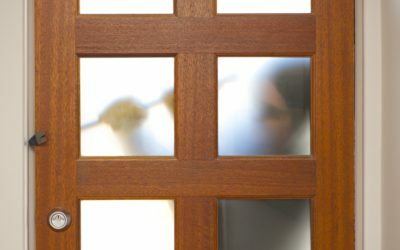 They are removable for easy cleaning or customization. A nylon fob adds real estate to the handle for a solid purchase in hand. The Sting 3B includes a glass reinforced nylon sheath with a removable stainless-steel spring clip for attaching to the boot, waistband or gear. The clip is reversible for tip up or tip down carry. The sheath has a molded lanyard hole for attaching paracord for tip up neck carry. The sheath retention is solid and strong. 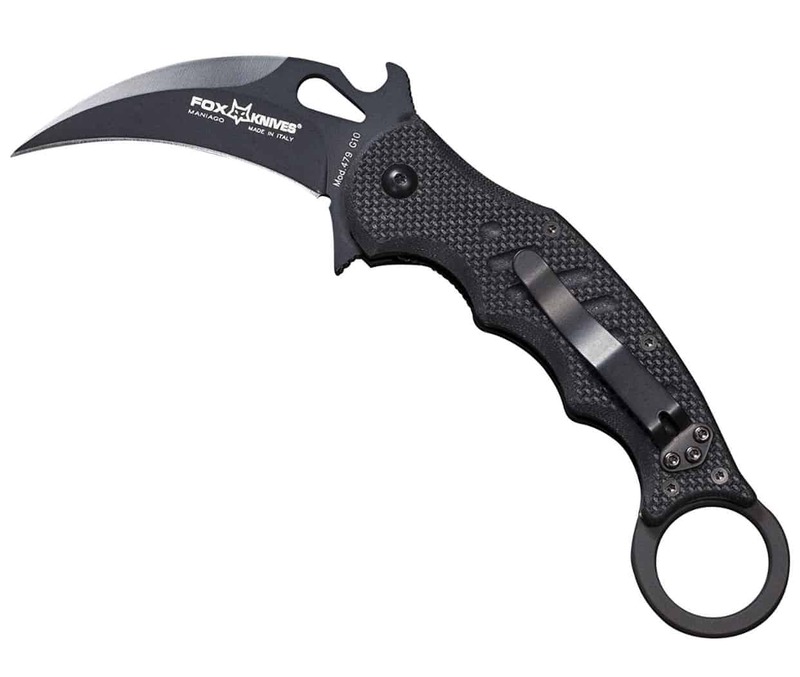 Fox 479 G10 Emerson Wave Karambit The Fox 479 Folding Karambit has been tested in extreme climates and is the highest quality available today. Please note this is the only folding model to make my list. The Emerson Wave feature allows for fast deployment. This knife also features a retention ring to provide a more sure and secure grip. I am partial to the knifes that will fit in a pocket, or in my boots. I like the sheathable options that can go in a sheath on my belt, or on a shoulder sheath. I am really starting to like the Karambit styles that are becoming popular these days. If you will notice, my list is comprised of either one or the other from my wants above. I want it to be concealable but with aggressive styling enough to intimidate the assailant if I need to pull it out. I want the bad guy to see it and think twice. All these models meet that requirement. I also want a quality steel, but affordability. If the Benchmade brand is the Cadillac of EDC knives, I tried to use that as the benchmark, for quality. For my list I looked at my selections to insure they were precision sharpened, had a great grip and felt comfortable in the hand. The 5 above more than met these requirements. These ladies and gentlemen are my best 5 knives for everyday carry. I would like to pray I never need to use them or my concealed carry, for that matter, but if put in a precarious situation, I want a knife that I can depend on, if called upon. I think these 5 will do just fine if pressed into service.